Have you found an online vendor selling Bacoo 8-Year? 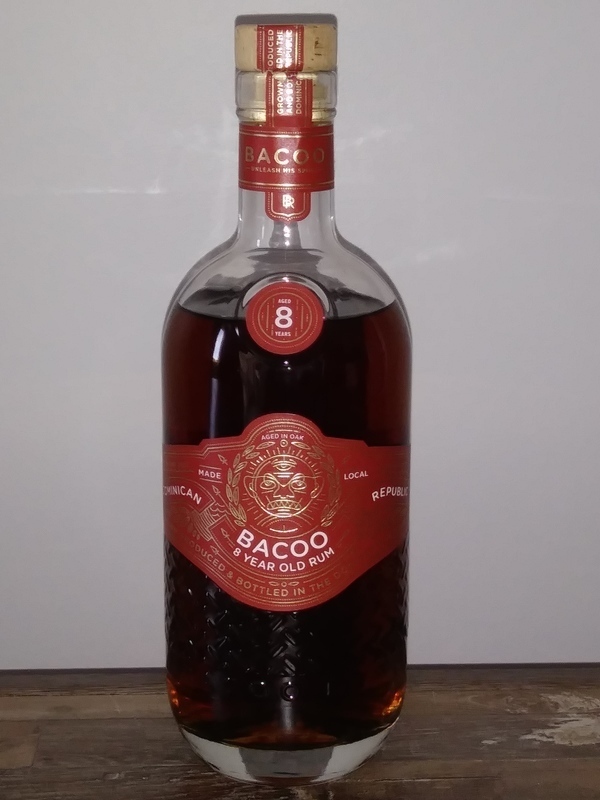 Bought a bottle of Bacoo 8 year old rum from DR with relatively high hopes since I scored the 12y Bacoo 9 but this 8y rum is far from the older sibling. Bottle and label design are identical. They are very nice for a sub $30 rum. Color is surprisingly dark for an 8y rum, so coloring is most likely being used. Nose reveals a faint vanilla and butterscotch, but you have to pay attention or you will miss it. Palate and afterburn is absolutely nothing! Very disappointing indeed. The 8y Bacoo is like a watered down version of something with a sliver of potential. 12y Bacoo 9 versus 8y Bacoo struggles to earn a 6. A dark rum that can be sipped, but most of the time mixed. I felt it was a good value for the price and will buy again. The legend of the Bacoo spirit is quite hilarious upon first reading about it from their website. It is a dwarf like spirit that almost sounds like a spider monkey with long arms and legs, big eyes, and short height, especially when it's favorite foods are bananas and milk. This Bacoo can do both good and bad things, so to keep him happy, provide him with a daily supply of milk and bananas. When he is bad, add these favorites into an empty bottle of rum and then cork him in tightly, which can later be cast out to sea. The company's motto is Unleash The Spirit. This marketing campaign is almost as ridiculous as for The Kraken monster, but unlike Kraken Rum, this Bacoo 8 year old is quite good. Bacoo Rum is basically made from cane juice obtained from sugar cane grown on the island, and then aged in oak whiskey barrels. It is literally from farm to table and their age is honest and not based on a confusing solera system designed to deceive buyers. At only $23, this is a good buy for an 8 year old rum. The nose basically assaults the senses with complex flavors and no alcohol burn. It is smooth on the tongue with even more complex pleasant flavors going down the pipe. As it breathes in the bottle over the next few weeks, this may change, and hopefully for the better. Technically, this is a rhum agricole, but does not taste like one at all due to spending eight years in charred oak bourbon barrels. So maybe some Bacoo Rum with Bumbu banana flavored rum and cream could soothe this spirit. It was delicious at the very least, and no wonder this drink worked well. After sipping Bacoo 8 neat a few weeks later, those "complex" aromas and after taste revealed themselves to be banana. The company did not say anything at all about NOT adding sugar, so some small banana flavoring must have been added to appease the Bacoo spirit. No wonder I like it! Then again, I now think twice about searching for the Bacoo 12. Update May 14, 2018: Drink too much of this crap and the Bacoo Spirit will get to your system and marry you to the royal porcelain throne the next day if not sooner. For this reason, it gets docked from a rating of 6 to a rating of 5, which means that I will never buy this one again. My rating of 6 means that I would even think about buying it again, but highly unlikely. My ratings of 5 and below means that I would never buy these again. There are three Bacoo rums available...the 5-year, the 8-year, and the 12-year. Since I have a bottle of each I am going to review all three today. They have a website (http://bacoorum.com/) which contains the legend of the Bacoo along with various information concerning the company. As with the 5-year Bacoo rum the aroma in the snifter is quite nice. A bit sweet with more other more noticeable complex aromas which I cannot specifically identify. Warm amber in color indistinguishable from the 5-year Bacoo. Swirling it in my snifter reveals good legs. The flavor is nice but just a tad too sweet for an 8-year old rum. I really think this has been sugared a bit. It feels a little oily on the tongue and has the same distinct butterscotch and vanilla flavors. A little smoother than the 5-year but essentially the same flavors. As with the 5-year there is some oak flavor via tannin in the wood barrels. The finish is of the butterscotch. It is worth trying but nothing really stands out. A usable rum at about $25 a bottle. A little overpriced.